Autochem Xact Pro | ARKRAY, Inc. 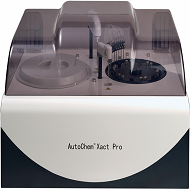 The Autochem Xact Pro is a Fully Automatic Random Access Clinical Chemistry Analyzer. It is a compact, benchtop analyser with throughput up to 200 tests per hour. Removable & flexible Sample - Reagent Disc with 40 Open position for reagent & samples respectively.